International Labour Organization (ILO) revealed in its annual report that as the momentum for growth has come to a halt, the fiscal crisis in Palestine is turning into an economic and social one. According to the report, the crisis is due to a number of factors, including the continued failure of donors to meet their commitments, the decision of Israel to suspend, at least temporarily, the payment of clearance revenues, as well as the pace of settlement growth. "This situation calls for measures by Israel not only to relax the application of restrictions on people and businesses but to lift them altogether, thus enabling the Palestinian economy to grow and generate decent jobs," ILO Director-General, Guy Ryder, said in his preface to the report. "The continuing occupation and expanding settlement activity are blocking the Palestinian economy, particularly its private sector, from significant progress," he added. The current situation will remain unsustainable until it is based on social justice. "At the very least, nothing should be done to make the situation worse. Denying rightful resources to the Palestinian Authority, stepping up the already unprecedented pace of settlement growth and constraining the Palestinian economy through restrictions and the weight of the settlements, will inevitably destroy any belief in the promise of two states for two peoples," Ryder said. In its Weekly Report On Israeli Human Rights Violations in the Occupied Palestinian Territories for the week of 30 May - 04 June 2013, the Palestinian Center for Human Rights (PCHR) found that 7 civilians were wounded, including 2 children, by Israeli troops this week. 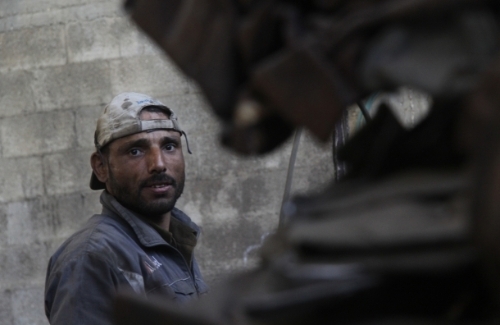 A Palestinian worker was wounded in the north of the Gaza Strip. A child was wounded during an Israeli incursion in al-Khader village, south of Bethlehem. 4 protesters, including a freelance photojournalist, were wounded during a peaceful protest in Bil'in village, west of Ramallah, and a Palestinian child was wounded during a peaceful protest in the north of Bethlehem. Israeli forces conducted 70 incursions into Palestinian communities in the West Bank, abducting 24 Palestinian civilians, including 6 children. Also in the West Bank, on 30 May 2013, a child was wounded when Israeli forces moved into al-Khader village, south of Bethlehem, and opened fire. Israeli forces established dozens of checkpoints in the West Bank. 5 Palestinian civilians, including 2 children, were abducted at checkpoints in the West Bank. Israel has continued its efforts to create Jewish majority in the occupied East Jerusalem. Israeli forces issued more house demolition notices in the city. The settlers attempted to seize a house and wrote racist slogans on a church. On Sunday, 02 June 2013, crews of the Israeli Municipality in Jerusalem handed administrative orders to demolish two houses in Silwan village in the south of the old city. The demolition orders were distributed to houses that were built many years ago, and a fine was imposed on them after their owners had been handed several administrative demolition orders times. On Friday, 31 May 2013, settlers wrote anti-Christian graffiti on the back wall of the Church of Zion near the southern wall of the old city of occupied East Jerusalem. The graffiti written on the wall of the church included various vulgar and racist statements, including “Christians are slaves,” “Christians are Monkeys,” in addition to “Price Tag”. Also on Friday, a group of settlers attempted to seize an apartment in Jaber family's building in Sho'fat neighbourhood in the north of Jerusalem by manipulating an order of the Israeli Magistrate's Court. According to sources from Sho'fat neighbourhood, approximately 15 settlers raided the apartment in the evening in an attempt to seize it, but the Israeli police arrived at the scene and forced them to leave; however, 1 settler stayed in it. On Thursday, 30 May 2013, Israeli forces closed the dirt road connecting Tafouh and Ethna villages, west of Hebron, with sand barriers and rocks in the context of an Israeli policy to confiscate farmlands in favour of settlement expansion in "Tailm" settlement. Also, farmers from Barquin village were surprised to find notices placed on their farmlands, ordering them to evacuate 22 dunums of land within 45 days, in order to confiscate them for the purpose of the expansion of "Ariel" settlement. Furthermore, a map showing the location and area was attached to the notices. On Saturday, 01 June 2013, the locals in Jinasafout village, east of Qalqilya, were informed that the Israeli authorities decided to "transfer title" of 573 dunums from the residents of the village; thus, confiscating the entire western side of the village's lands. 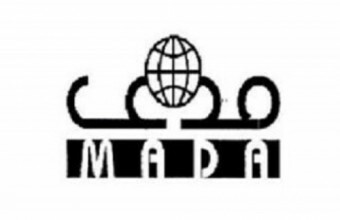 The confiscated lands belong to the Eid, Bashir, Sabra and Ayoub families from Jinasafout, and other families from the neighbouring Hajja village. On Monday, 04 June 2013, Israeli forces, moved into Kherbat Um Neir area in the south of Yatta village, south of Hebron, and destroyed and confiscated a tent that is used for storing grains, which is the property of Omar Mohammed Ahmed al-Jabour. In the Gaza Strip, on 02 June 2013, Israeli forces stationed on watchtowers along the border fence, east of Abu Safiya area in the north of the Gaza Strip, opened fire at a group of workers and bird hunters. As a result, Ahmed al-Hamadeen (21) was wounded by a bullet to the right thigh. Israeli navy forces continued to pursue Palestinian fishermen in Gaza sea. On 02 June 2013, Israeli forces opened fire at Palestinian fishing boats that were sailing within the 6 nautical mile limit off al-Waha resort in the north of the Gaza Strip. Neither casualties nor material damage were reported. Israel has continued to impose a total closure on the Occupied Palestinian Territories and has isolated the Gaza Strip from the outside world. The illegal closure of the Gaza Strip, which has steadily tightened since June 2007, has had a disastrous impact on the humanitarian and economic situation in the Gaza Strip. The illegal closure has not only caused a humanitarian crisis, but also a human rights crisis and the erosion of human dignity for the people of the Gaza Strip. Recently-declared measures to ease the closure are vague, purely cosmetic, and fail to deal with the root causes of the crisis. The root causes can only be addressed by an immediate and complete lifting of the closure, including lifting the travel ban into and out of the Gaza Strip and the ban on exports. Palestinians in Gaza may no longer suffer from the same shortage of goods but, as long as the closure is allowed to continue, they will remain economically dependent on Israel, unable to care for themselves, and socially, culturally, and academically isolated from the rest of the world. Israeli forces have continued to support settlement activities in the West Bank and Israeli settlers have continued to attack Palestinian civilians and property. Israeli authorities issued decisions to evacuate and confiscate 595 acres of land in Qalqilia and Salfit in the north of the West Bank. The settlers continued their systematic attacks against Palestinian civilians and their property under the Israeli forces' protection. On Friday, 31 May 2013, dozens of armed settlers closed the entrance of Beit Ummar village, north of Hebron. This incident took place under the protection of Israeli forces, claiming that a protest was attacked with stones while driving through bypass road no. (60), which is located near the village. 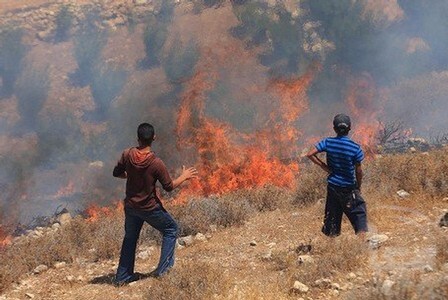 On Sunday, 02 June 2013, a group of settlers from "Nahalial" settlement, established in the eastern side of Betello village, northwest of Ramallah, set fire to dry herbs. The fire expanded and reached some forest trees in "al-Thohour" agricultural area in the east of the village, near the afore-mentioned settlement, before the Civil Defence crews could control it. On Sunday, 02 June 2013, dozens of settlers from "Tafouh" settlement, south of Nablus, closed the main street of Yassouf village, east of Salfit, and banned Palestinians from passing through it. Israeli forces continued the systematic use of excessive force against peaceful protests organised by Palestinian, Israeli and international activists against the construction of the annexation wall and settlement activities in the West Bank. As a result, 4 civilians, including a freelance photojournalist, were wounded and others suffered tear gas inhalation. Moreover, dozes sustained bruises due to attacks by Israeli soldiers. The 4 civilians were wounded in Bil'in weekly protest, west of Ramallah, on 31 May 2013. Palestinian civilians also organized protests in support to Palestinian prisoners in the Israeli jails, especially those on hunger strike. Israeli forces used excessive force against the protestors. As a result, a child was wounded at the northern entrance of Bethlehem on 31 May 2013. Due to the number and severity of Israeli human rights violations this week, the PCHR made several recommendations to the international community. Among these were a recommendation that the UN General Assembly to transfer the Goldstone Report to the UN Security Council in order to refer it to the International Criminal Court in accordance with Article 13(b) of the Rome Statute. The PCHR also called upon the United Nations to confirm that holding war criminals in the Palestinian-Israeli conflict is a precondition to achieve stability and peace in the regions, and that peace cannot be built on the expense of human rights and victims. A total of 1.3 million people representing 27% of households in Palestine remain food insecure, according to an official report. IA report, issued by the Palestinian Central Bureau of Statistics (PCBS) on World Environment Day on 5 June, confirmed that "according to classification of the World Food Program, FAO, and UNRWA, on Palestinian households with regard to food security; a total of 1.3 million people representing 27% of households in Palestine remain food insecure in 2011". The report added that 14% of the households are vulnerable to food insecurity, 22% are marginally secure and 37% are food secure. 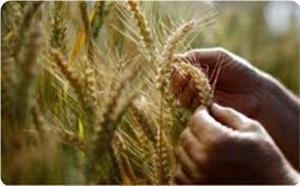 It is important to note that food security rates include the impact of any assistance received during the reference period. According to FAO, food security exists when all people, at all times, have physical and economic access to sufficient, safe and nutritious food to meet their dietary needs and food preferences for an active and healthy life. Not long ago, Israeli Minister of Economy Naftali Bennett, former chairman of the Judea, Samaria and Gaza Council, called on Israel to impose sovereignty unilaterally on Area C and then grant Israeli citizenship to Area C’s local Palestinian residents, whom he said numbered 50,000. The above proposal considers Area C an independent region, separate from the rest of the West Bank. Yet the division of the West Bank into Areas A, B and C does not reflect a geographic reality, but rather an administrative division made as a part of the Interim Agreement of the Oslo Accords. The division was to have been temporary and to have enabled an incremental transfer of authority to the Palestinian Authority. It was not designed to address the needs of long-term demographic growth. Nonetheless, this “temporary” arrangement has remained in force for nearly twenty years. Some 60 percent of West Bank lands have been classified as “Area C” and are under full and exclusive Israeli control. Area C is home to an estimated 180,000 Palestinians and includes the major residential and development land reserves for the entire West Bank. Israel prohibits Palestinian construction and development on some 70 percent of Area C territory, arguing various rationales, such as being “state lands” or “firing zones.” Israel’s planning and construction policy virtually ignores the needs of the local population: it refuses to recognize most of the villages in the area or draw up plans for them, prevents the expansion and development of Palestinian communities, demolishes homes and does not allow the communities to hook up to infrastructure. Thousands of inhabitants live under the constant threat of expulsion for living in alleged firing zones or “illegal” communities. 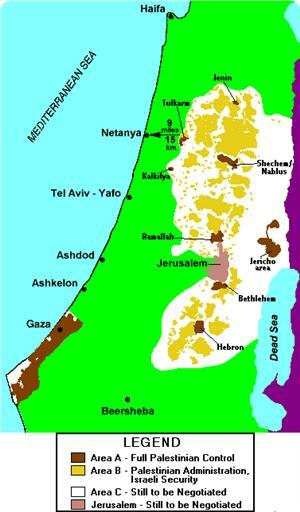 In addition, Israel has taken over most of the water sources in Area C and has restricted Palestinian access to them. In theory, Israel retains full control in the West Bank only of Area C. In practice, Israel’s control of Area C adversely affects all Palestinian West Bank residents. Scattered throughout the vast expanses of Area C are 165 “islands” of Area A- and B-land that are home to the major concentrations of population in the West Bank. The land reserves that surround the built-up sections of West Bank towns and villages are often designated as Area C, and Israel does not allow construction or development on these reserves. 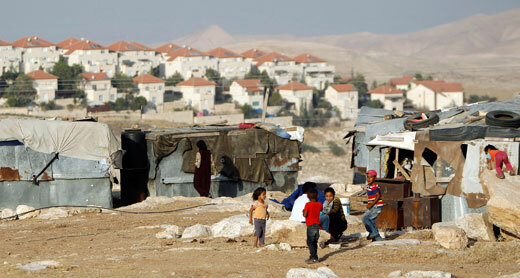 Israel thereby stifles many Area A and B communities, denying them the opportunity to develop. This is one of the contributing factors to the difficulty in obtaining lots for construction, the steep price hike in the cost of the few available plots, the dearth of open areas, and the total lack of suitable sites for infrastructure and industrial zones. If, for want of an alternative, residents of these areas build homes without permits on nearby land – owned by them but classified “Area C” – they live under the constant shadow of the threat of demolition. There are dozens of Palestinian villages in the South Hebron Hills that the Civil Administration refuses to recognize and for which it does not prepare master plans. Over 1,000 people, residents of eight of these villages, currently live under the perpetual threat of expulsion on the grounds of residing in a designated “firing zone”. The Civil Administration plans to uproot at least two thousand Bedouins from land near the settlement of Ma’ale Adumim and transfer them to so-called “permanent communities” in order to expand nearby Israeli settlements and achieve a contiguous built-up bloc linking the settlements to the city of Jerusalem. Previously, hundreds of Bedouins from this area had been displaced for the establishment and then the expansion of Ma’ale Adumim. Palestinians in the Jordan Valley are subject to frequent house demolitions. They are occasionally evacuated for the benefit of military exercises and must deal with the confiscation of water cisterns that are the source of drinking water for them and their livestock. Al-Khader, Yatma and Qibyah are examples of Palestinian communities most of whose built-up area is located in Area B. Yet most of these communities’ lands available for construction of homes, infrastructure and public services are located in Area C, where the Civil Administration does not allow construction and development. Palestinians in these communities who, for the want of any other options, built homes on their community’s lands in Area C, face the constant threat of demolition. Some Area C residents, harmed by Israel’s planning and building policy, have applied to Israel’s High Court of Justice for redress. However, of the dozens of petitions submitted, the court deemed not a single case worthy of its intervention with Civil Administration considerations. The court thus enabled the restrictive, harmful and discriminatory policy to carry on. At the same time, and counter to international law, Israel encourages its own nationals to settle in the West Bank. Israel allocates vast tracts of land and generous water supplies to these settlements, draws up detailed plans that take into account both current requirements and future expansion, and turns a blind eye to violations of planning and construction laws in settlements. Israel’s policy in Area C is anchored in a perception of the area as meant above all to serve Israeli needs. Consequently, Israel consistently takes actions that strengthen its hold on Area C, displace Palestinian presence, exploit the area’s resources to benefit Israelis, and bring about a permanent situation in which Israeli settlements thrive and Palestinian presence is negligible. Israel’s actions have brought about a de facto annexation of Area C and have created circumstances that will influence the final status of the area. Israel’s policy in Area C violates the essential obligations of international humanitarian law, namely: to safeguard occupied territory on a temporary basis; to refrain from altering the area or exploiting its resources to benefit the occupying power; and, most importantly, to undertake to fulfill the needs of the local residents and respect their rights. Instead, through the Civil Administration, Israel pursues a policy designed to achieve precisely the opposite: the Civil Administration refuses to prepare master plans for the Area C communities and draws on the absence of these plans to justify the prohibition of virtually all Area C construction and infrastructure hook-ups. In cases where, having no alternative, residents carry out construction despite the prohibition, the Civil Administration demolishes their homes. 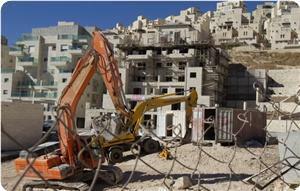 Israel utterly ignores the reality that residents cannot build their homes legally. Israel conducts itself as though this situation were not in fact a direct result of its own policy. As long as Israel controls the West Bank, including Area C, it must meet its obligations under international law and human rights law. First, Israel must revoke the allocation it has made of vast tracts of “state land” to the local and district councils of settlements’ – whose very existence is in contravention of international law – and also retract the classification of extensive areas as firing zones. Second, Israel must allocate lands throughout Area C to Palestinians for housing, infrastructure and industrial zones, and pursue an expert planning process whose top priority will be the needs of the Palestinians in the West Bank. In accordance with Jordanian law which was in effect in the West Bank before Israel changed it, representatives of the local Palestinian population must be included in this process. The process must also feature recognition of existing communities in the West Bank, and all Palestinian residents of the West Bank must be promptly hooked up to water and power infrastructure. Israel must work in conjunction with Palestinian Authority representatives to promote overall planning in the West Bank and to address the planning and development needs of the residents of the entire West Bank. As long as Israel retains planning authority in Area C and does not allow Palestinians to build legally, it must immediately desist from demolishing homes, business-related structures (e.g., buildings used for agriculture or trade) and rainwater-collection cisterns. In addition, Israel must not expel people from their homes in the absence of a clear, essential and immediate military justification. Nearly 1518 Palestinian children were killed since the second Palestinian Intifada (uprising) in 2000, according to a Palestinian official report. The report, issued by the Ministry of Information on Monday, affirmed that six thousand children were injured since the beginning of the Al-Aqsa Intifada 13 years ago. The report came to mark the International Day for the Protection of Children in light of the Israeli brutal daily practices against Palestinian children. The report confirmed that 9000 children under 18 were arrested since the 2nd uprising, including 881 children in 2012. The Ministry said that 246 children under 18 are currently held in Israeli jails, including 47 children under 16. The report stated that the children under 18 constitute 47.6 per cent of the total population. In September 2012, Israel’s Public Defender's office published a report [pdf] on the isolation of inmates in Israeli prisons. The report criticized the isolation of minors and called for use of this measure to be restricted or at least limited in scope. Other points of concern raised in the report include: the use of isolation instead of other available measures to deal with inmates who suffer from mental problems; the mental harm caused to inmates by isolation; and the lack of rehabilitative, occupational, educational or recreational activities for isolated inmates. Two kinds of isolation are used in Israel’s prison system: solitary confinement, in which the inmate is held alone, and confinement in pairs, in which two inmates are held together in a cell and are entirely cut off from all other inmates. 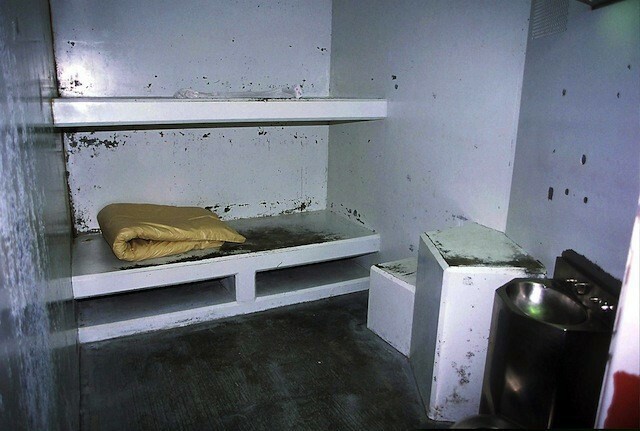 Isolated inmates are permitted to leave their cells for only one out of every 24 hours. The Israel Prison Service (IPS) orders [pdf] allow the isolation of inmates, both adults and minors, for long periods based on an administrative decision made by an IPS official. Holding an inmate in isolation for up to 12 hours requires authorization by an IPS chief superintendent. Extending the isolation period for more than 48 hours requires authorization by the prison’s commander or deputy commander, ranking deputy commissioner; either of them can authorize such extensions repeatedly, for a total period of 14 days. Solitary confinement can be extended for a month at a time for as long as half a year, and confinement in pairs can be extended for two months at a time for as long as a year; both require authorization by an IPS regional commander or deputy commander. Holding inmates in isolation for any longer than that requires authorization by a district court. The IPS orders define isolation as a preventive measure that must not be used punitively and can only serve as a last resort. According to these orders, the rationale for holding an inmate in isolation can be: 1. Prison security. 2. Preventing substantial harm to prison routine and discipline. 3. Protecting the wellbeing or the security of the inmate, or of other inmates. 4. State security. 5. Preventing a violent offence (in the context of the war on organized crime) or a drug-related offence (according to the Dangerous Drugs Ordinance). 6. In the case of a minor inmate – if isolation is necessary for his or her wellbeing. In response to a request submitted under the Freedom of Information Act, the IPS recently sent B’Tselem information on the isolation of inmates, which contained general data about Israeli inmates and more detailed data about Palestinian inmates. In its response, the IPS wrote that “isolation is a highly exceptional procedure, used with periodic supervision and under strict judicial review, while ensuring that the legal rationale for the isolation exists”. However, the figures sent to B’Tselem indicate that isolation is used not only in exceptional cases: from 1 January 2007 to 28 April 2013, 5,602 inmates were held in isolation, some of them on more than one occasion. 4,078 of the inmates were Israelis, 1,493 were Palestinians (including residents of East Jerusalem), and 31 were of another nationality. Almost all of the inmates held in isolation were convicted prisoners, and only 12 were under arrest. B’Tselem requested a breakdown of the figures based on the rationale for isolation, but received no response. As stated, from 1 January 2007 to 28 April 2013, 1,493 Palestinian inmates were held in isolation. On 1,786 occasions, they were held alone, and on 847 occasions, they were held in pairs. 18 adult Palestinians, all men, were held in solitary confinement for more than half a year, continuously; of these, seven men were held for more than three years, and three men were held in continuous isolation for more than seven years. Three adult Palestinians, all men, were confined in a pair for more than half a year, continuously; of these, one was held in continuous isolation for more than three years. In the data provided regarding separate occasions of isolation that accumulated to long periods, solitary confinement was not differentiated from confinement in pairs: 14 inmates were held in isolation on separate occasions that, cumulatively, amounted to more than half a year; of these, seven were held for more than three years, in total, and three were held for more than seven years, in total. The international standards set by the UN absolutely forbid holding minors in isolation, which is considered a cruel measure that could harm their wellbeing or safety. While these standards are not binding, they serve as guidelines for the treatment of minors in custody. From 1 January 2007 to 28 April 2013, 76 Palestinian minors – 75 boys and one girl – were held in isolation on 100 separate occasions: on 68 occasions (including the only girl), a minor was isolated alone, and on 32 occasions, minors were isolated in pairs. Seven of the minors were less than 16 years old, and the rest were 16 to 18 years old. Of the former age group, one minor was held in isolation on two separate occasions, and the rest were held once. The figures provided by the IPS did not indicate whether they were held alone or in pairs. The single girl, who was more than 16 years old, was held in isolation once, alone, for a period of up to a week. The 68 male minors above the age of 16 were held in isolation on 91 occasions. The IPS did not detail how many times each one of them was held in isolation. Prolonged isolationThe IPS provided two kinds of figures regarding Palestinian minors isolated for long periods: continuous isolation and accumulated periods of isolation. 28 minors were held in solitary confinement for a continuous period of up to a month. 39 minors (including the girl) were held in solitary confinement for a continuous period of up to a week. 15 minors were confined in pairs for a continuous period of up to a month. 17 minors were confined in pairs for a continuous period of up to a week. The figures on cumulative periods of isolation were not divided into solitary confinement and confinemen in pairs, nor was the number of occasions that each minor was put in isolation mentioned. One minor was held in isolation on several different occasions, for a cumulative period of 91 to 183 days (The IPS did not provide a more exact figure). One minor was held in isolation, on separate occasions, for a cumulative period of one to three months (The IPS did not provide a more exact figure). 39 minors were held in isolation, on separate occasions, for a total of one month. 35 minors (including the girl) were held in isolation, on separate occasions, for up to a week. Holding a person in isolation can have harsh implications, and the IPS orders allow use of this measure only as a last resort and for the minimal amount of time needed. The standards set by international law absolutely forbid holding minors in isolation, and experts in the treatment of minors have clarified how destructive such an experience may be. On 29 May 2013, the Knesset’s Interior Committee discussed the conditions in which inmates are held in isolation. According to a report in the Israeli newspaper Haaretz, Adv. Galia Nitzany of the Public Defender's office stated before the Committee that, in addition to the sheer number of inmates being held in isolation – some 100 inmates, nine of them minors, on the day of the discussion, according to the IPS – the conditions in which they are being held are illegal. Some of the inmates have been held in isolation while handcuffed; in one case, matters deteriorated so far that an inmate’s handcuffs turned rusty and the IPS had to saw them off. The isolation of Israeli and Palestinian inmates in Israeli prisons is highly problematic: it is used frequently, for long periods of time, and under harsh conditions, as reported by Adv. Nitzany. In addition, the fact that judicial review is required only after half a year, when an inmate is isolated alone, or after a year, if inmates are isolated in pairs, constitutes inadequate supervision. In a discussion following the Knesset Committee’s discussion, Attorney General Yehuda Weinstein supported stricter supervision over the conditions in which inmates are held in isolation, particularly where minors are concerned. B’Tselem calls upon the Attorney General and all relevant officials to take swift and efficient action in this matter, including setting strict rules for the isolation of adult inmates and enhancing judicial review, in order to ensure that isolation is used only as a last resort, when no other means are available. B’Tselem calls upon the IPS to completely refrain from holding minors in isolation. 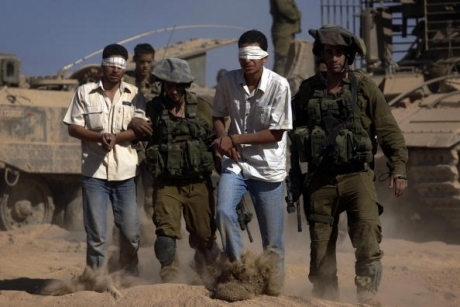 The Palestinian Prisoners Center for Studies issued its monthly report on the Palestinian political prisoners, held by Israel, and stated that Israeli soldiers carried out more than 280 invasions, in May, and kidnapped 370 Palestinians. The center said that the some of the detained Palestinians were released later on, while the rest are still imprisoned and facing ongoing interrogation and abuse. It added that most of the arrests in May were carried out in Jerusalem, as the soldiers kidnapped 105 Palestinians from their homes and from the streets and alley of the occupied city. Furthermore, soldiers kidnapped 9 women, and more than 30 former political prisoners, in addition to journalists and nonviolent activists. In Gaza, the army kidnaped six Palestinians, including four fishermen and confiscated a number of fishing boats. Soldiers also kidnapped two journalists in the Hebron district, in the southern part of the occupied West Bank. In occupied Jerusalem, the army detained and interrogated Sheikh Mohammad Hussein, the Grand Mufti of Palestine and the Holy Lands, and released him several hours after constant interrogation. Soldiers also kidnaped Mustafa Abu Zahra, the head of a committee in charge of maintaining Islamic graveyards in occupied Jerusalem. Palestinian researcher, head of the Media Department at the Palestinian Prisoners Center, Riyadh Al-Ashqar, stated that the army also kidnapped more than 85 children in May, including Khaled Dweik, 9, and Amro Dweik, 7. Al-Ashqar added that, in one incident, soldiers kidnapped 45 children near school in Hebron, and interrogated them for several hours before releasing 34 children and the rest remained under interrogation. He further stated that the soldiers kidnapped and imprisoned nine women in May, and took them to several interrogation and detention facilities.